Rookwood Pottery is known for having many women artists on staff over its long lifespan. It has the distinction of being the first manufacturing company in the United States founded by a female. Maria Longworth Nichols started Rookwood Pottery in Cincinnati, Ohio in 1880. She reportedly chose the name for the company after noting the many rooks, also known as crows, on her father’s estate and added “wood” in recognition of Wedgwood, according to Warman’s Antiques & Collectibles edited by Noah Fleisher. In 1883, after much success earning medals for the company's work, namely at the Exhibition of American Art Industry in Philadelphia and the Exposition Universelle in Paris, Nichols transferred her interest in the company to William W. Taylor. Taylor had served as the firm’s manager since 1883. 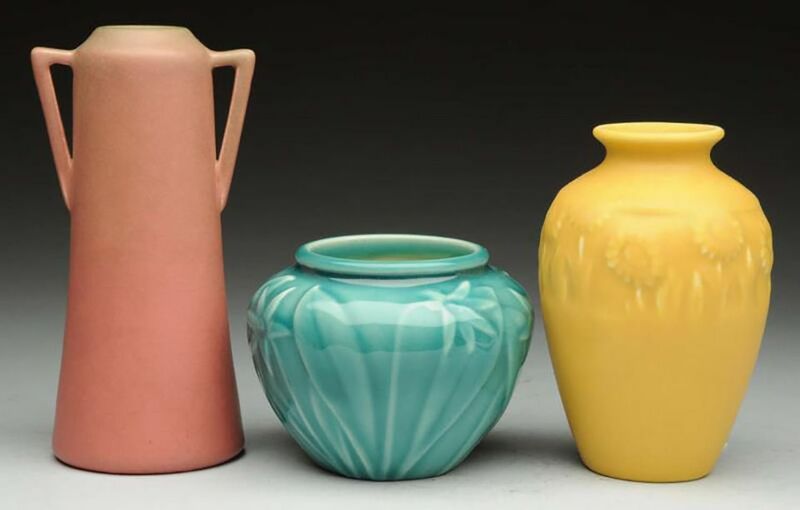 Under his command, the business went from a fledgling pottery company to a thriving entity over the subsequent decades as demand for American art pottery continued to increase approaching the turn of the 20th century. Rookwood’s early pottery production was based on exquisite pieces originating in Japan and other influences gleaned from European ceramics. Not surprising considering the company's founder clearly had an affinity for Wedgwood. In 1884, with the introduction of the company’s "standard glaze," Rookwood found its niche in the pottery world. From that point on, the firm’s team of talented decorators and glaze masters truly transformed American pottery production, according to the Rookwood Pottery website. Rookwood’s new Iris glaze, one of several introduced in the mid-1890s under Taylor’s forward-thinking direction, is attributed to Rookwood garnering the Grand Prix at the Paris Exposition in 1900. The company continued to reap accolades over the next several years, entering its wares in numerous competitions, as noted in ​Warman’s. Rookwood embraced the Arts and Crafts movement in the early 1900s. The company’s famed Iris line was discontinued in 1912, and other simplified designs and less complicated glazes were introduced. The company continued operating successfully through the 1920s but never recovered after struggling through the Great Depression only to close the shop in 1941. A group of investors led by automobile dealer Walter E. Schott and his wife, Margaret, bought the company and began production once again in the early 1940s. Rookwood changed hands numerous times before moving to Starkville, Mississippi in 1960. The doors of this legendary pottery closed for good in 1967. One advantage to collecting Rookwood is that it’s easy to date by examining the mark incised on the bottom of each piece. In 1886, the company began using a reverse RP logo. A flame was added around the logo each year to mark the date the piece was produced. In 1901, the company began using Roman numerals to date its pottery further clarifying the dating process. Many Rookwood pieces also have an artist’s mark, or cipher, on the base. These are either incised in the pottery or penned under the glaze. Identifying them is important when valuing Rookwood wares since a number of Rookwood artists have a loyal following among collectors of this pottery. Some pieces sell for exponentially more than those without an artist's signature. In 1887, ceramic artist Kataro Shirayamadani began decorating pottery for Rookwood. His work represents some of the company's most valuable pieces. A piece decorated by Shirayamadani sold at Cincinnati Art Galleries in 2004 for the whopping sum of $350,750. Since Rookwood pieces by signed notable artists can skyrocket in price at auction, keep in mind that identifying the decorator is a key element in valuing this pottery. Using the aforementioned artist’s ciphers, or marks, located on the bottom of many pieces is the way to accomplish this task. Rookwood’s pastel pieces are more common and less artistic than work of Shirayamadani and other popular artists. They are still widely collected and hold moderate value, but generally will not be as pricey as older hand decorated wares. Rookwood faience tiles are also valued by collectors when found in excellent condition. Those can also be quite expensive depending on the style.